You do not have to wait for spring to set in to do your spring cleaning. According to experts, the ideal time would be towards the end of winter, so that you can make a fresh start when spring rolls in. But the question is, where are you going to put the trash from your spring cleaning? While you may be looking forward to finally getting rid of all your clutter, you may be concerned about how you are going to do it. Be glad to know that Jux2 Dumpster Rental has dumpsters for rent to organize and haul your junk for you. For more information, give us a call and we will discuss in detail our roll off rental services in Lynn. A roll off rental service will save you time and trouble because all you have to do is to rent a roll off container and we will take care of the hauling requirements while you continue doing your daily tasks. Take advantage of our roll off rental service, rent a roll off container, and worry not about the junk piling up on your driveway. Our dumpsters at Jux2 Dumpster Rental are of different sizes. Choosing the right roll off rental container size is not an exact science. Our expert team is always there to help you through the entire process. Large-sized objects, though not necessarily heavy, will still need a bigger dumpster, but if you are putting in smaller-sized stuff, like books, clothes, rugs, or even plant debris, you can go with a smaller dumpster. Call us anytime at 781-476-5222 and allow us to explain the details concerning the various containers we have and then help you select the right dumpster size. Let us help you select the rental dumpster that will more appropriately suit your needs. 10-15 Cubic Yard Dumpster: Most people use this dumpster for smaller bathroom, kitchen or basement remodeling jobs. Typical projects requiring a small dumpster include a remodeling project for a small space, like a kitchen or a bathroom, and small cleanup projects. 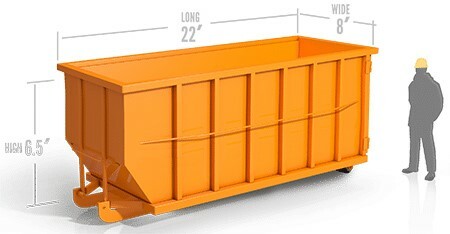 20 Cubic Yard Dumpster: A roll off container this size is recommended for a clean out project involving a bigger room. If you are cleaning up your basement or garage, or removing your carpet, then this is the container that will best serve your requirements. 30-40 Cubic Yard Dumpster: Large-sized dumpsters are ideal for home additions and construction projects. This translates to about twelve pick up loads of debris. You will be surprised to know that it does not cost a lot to rent a roll off container from Jux2 Dumpster Rental. If you are de-cluttering your house, or cleaning up after a major construction job, then you may want to consider a roll off rental. This will enable you to get rid of a lot of trash at once and it will be a lot easier than hauling away separate items. It just takes as little as a minute or two to provide some information about your ongoing project needs, and we do the rest. Give our experts at Jux2 Dumpster Rental an idea of the project you will be undertaking, the kind of waste you expect it to yield, and how much, and then we can provide you with a cost estimate. Call us now at 781-476-5222 to rent a dumpster. You will want to be properly informed about the necessities that go with roll off rentals. Usually, a rented dumpster will not be allowed on a public pavement where it will be a hindrance to passers-by or commuters. Any dumpster container that will be blocking a public right-of-way such as a sidewalk or traffic lane will require permits. If you are going to secure a permit, most likely the permit will come with limitations, such as that the dumpster will be placed on an area that will not get in the way of pedestrians. If you do not, you could suffer monetary fines and tickets depending on your city’s rules and regulations. This way you can keep the dumpster on the public property without being fined. A dumpster that sits comfortably on your own lawn will not need a permit. If you can safely place the container inside your own property, then you do not have to obtain a permit. Nevertheless, make sure to clarify this information with your local office so you can be ready with the requirements when the need for a rental dumpster comes along. Jux2 Dumpster Rental is the best choice for roll off rental containers in Lynn, waste pickup and other junk removal needs. Call us today if you need to rent a dumpster or if you need any assistance getting the right dumpster size for your ongoing project.